I’ll admit, I can get a bit lazy when it comes to making breakfast! Whenever I’m making breakfast food that’s a bit more evolved for myself, my kids, or my guests, I usually go to a great egg dish. It’s nice to have a fab brunch dish to pull out of your back pocket when needed. 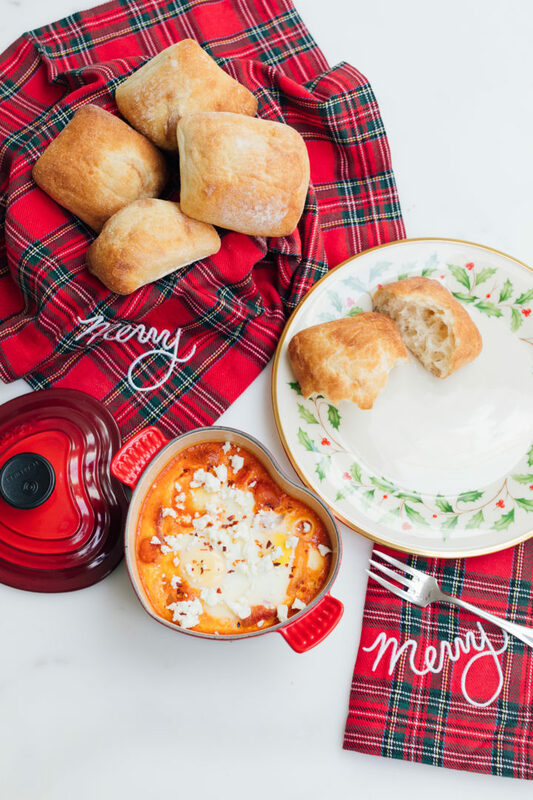 My recipe for Baked Eggs Fra Diavolo is so cute and festive for the holiday– and just happens to be delicious! 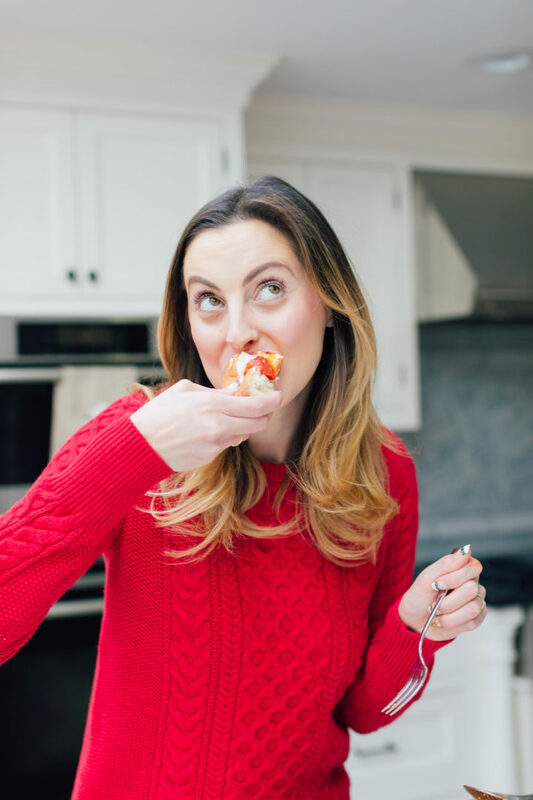 “Fra Diavolo” means from the devil in Italian, and is the classic description for any dish that is super spicy. And this is just the yummiest spicy brunch dish ever. 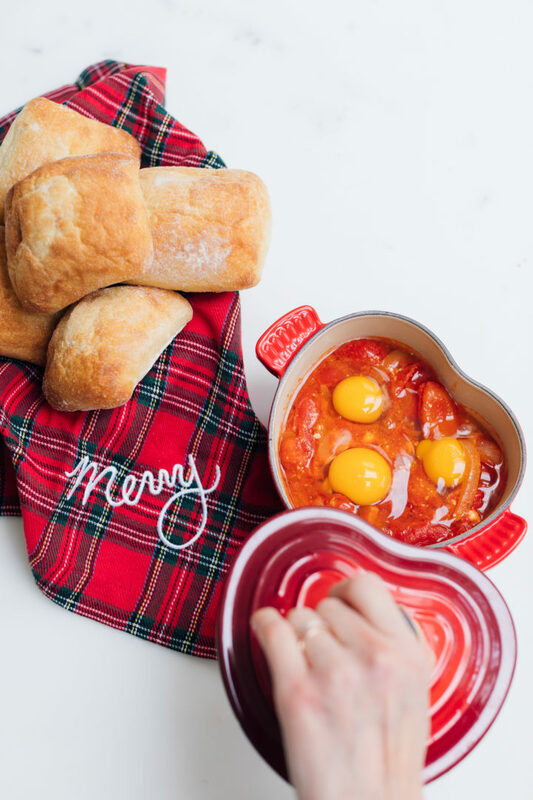 I love how the spiciness of the pepper and garlic in the tomatoes compliments the baked eggs, and sopping it all up with a hunk of great bread…ooooo baby! I like to serve this alongside a big green salad for brunch. 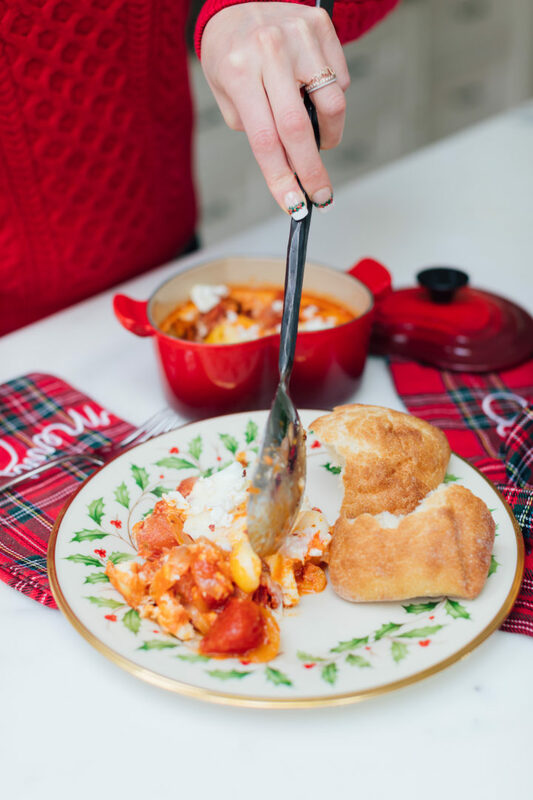 Baking this dish in a Le Creuset casserole dish is especially chic when you have company, but you can use a glass dish also, or whatever you have on hand that’s oven proof! The below recipe is for a smaller casserole dish size, as pictured, and serves 1-2. Simply double or triple the recipe for larger groups! 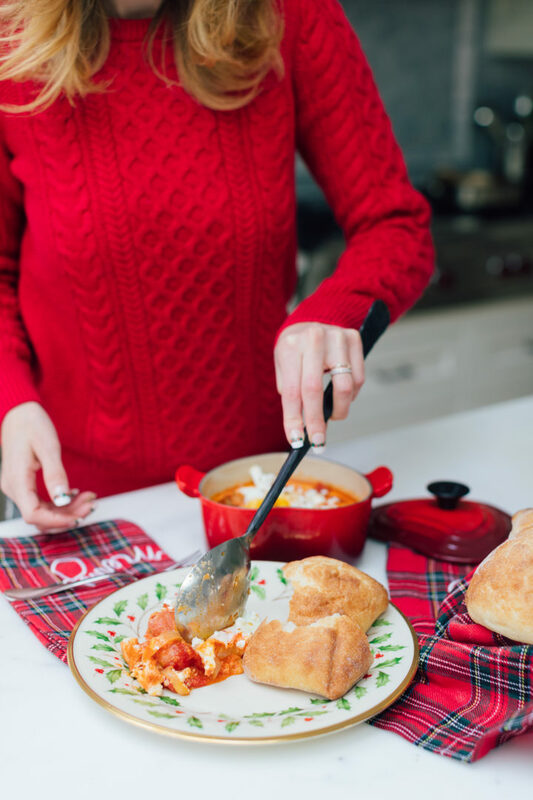 You can also make the tomato sauce part of this dish the night before so it’s all ready to assemble and then pop in the oven! Preheat your oven to 375 degrees, with a rack in the middle. Heat a medium sized sauce pan (with a higher lip) over medium/high heat. Add the olive oil, garlic, and onions to the pan, and sauté until the onions begin to become translucent, and the garlic is browning but not burnt. Add the red pepper flakes and the oregano, and turn the heat down to medium. Stir for one more minute, until the herbs become fragrant, then add the entire can of tomatoes. Turn the heat up to bring the tomatoes to a boil, then reduce the heat to simmer, cover the sauce pan, and stir occasionally while the tomatoes cook down, approximately 15 minutes. Uncover the pot, and cook 5 minutes more. Pour your tomatoes in your casserole dish, and allow to cool slightly. Take the feta cheese, and mix it in with the tomato mixture. Make 3 little holes in the tomato/cheese mixture, and crack an egg in each hole. Place the dish in the oven, and bake for approximately 10 minutes, or until the whites of the eggs are firm and the yolk is mostly cooked. 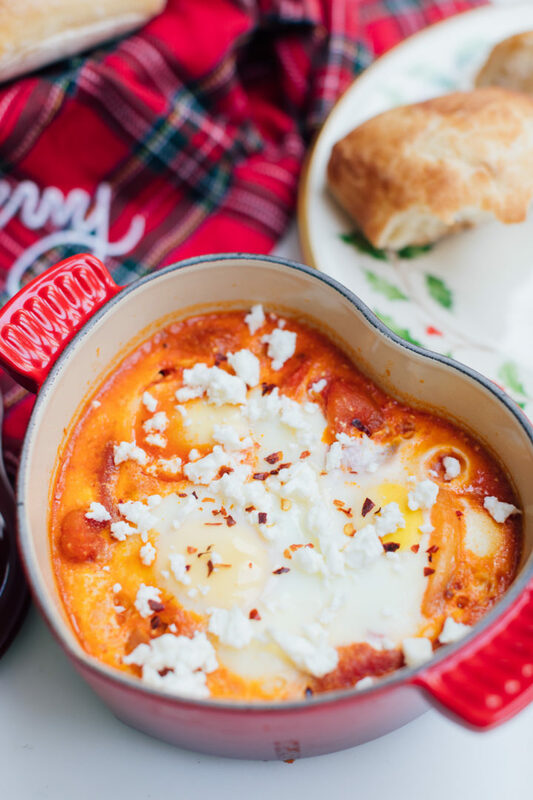 Remove from the oven, sprinkle with additional feta cheese, and serve with warm, crusty bread! Yum! 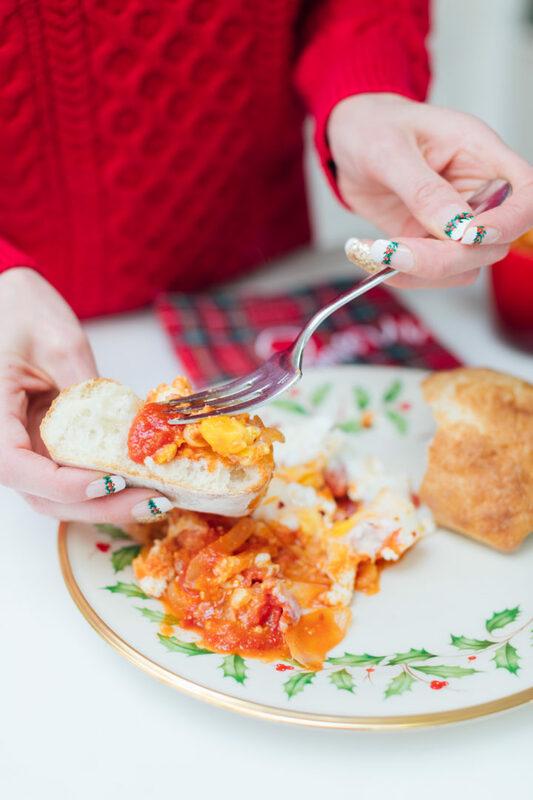 This looks so good – eggs, cheese, tomatoes, and chili flakes – this is like my dream comfort food! Eva, This sounds delicious. I am definitely going to have to make this for my husband. I swear he puts red pepper flakes on everything. Ha! I love that. I’m pretty much the same way ! Looks like I’ll be trying this new recipe over my Christmas stay home vacation. I suspect this will be a new favorite. Yummy! This looks amazing. Definitely trying this for Christmas! This is a great recipe! 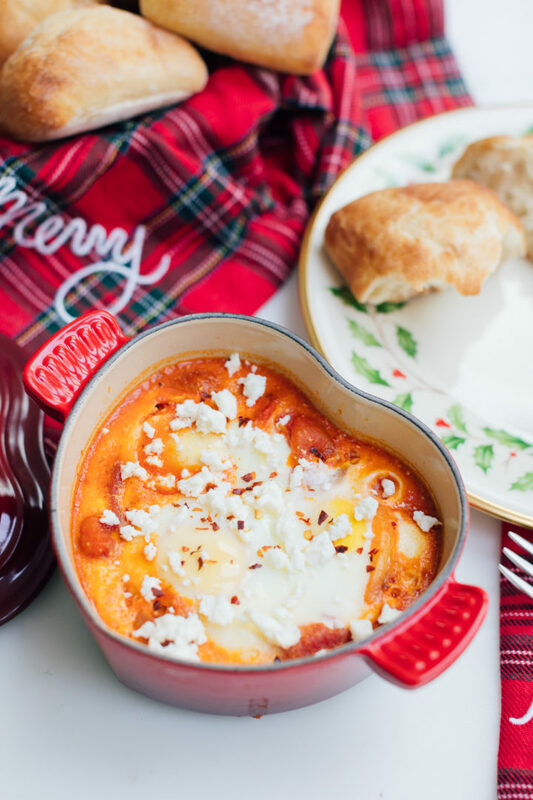 Made this for breakfast and we absolutely devoured it. A new favorite!! I made this for my family on Christmas morning, it was a huge it! 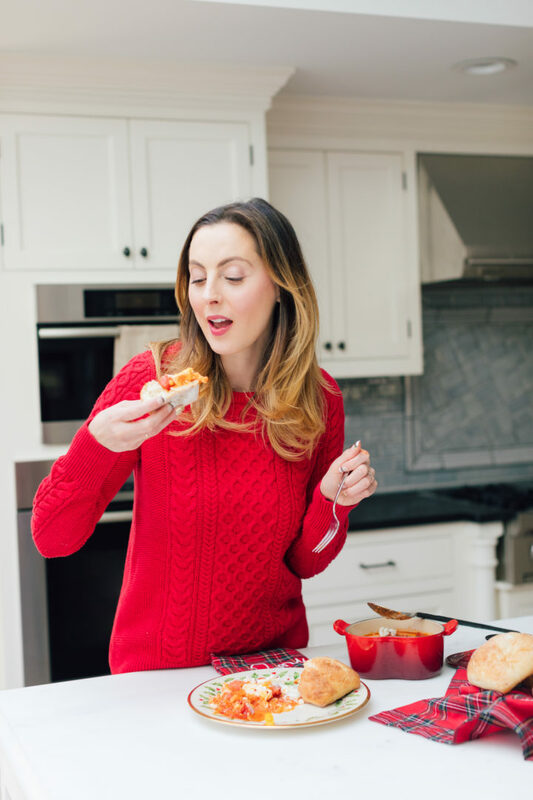 A perfect warm and cozy addition to the morning merriment (aka tired eyes and yawning).